Now available in a variety of beautiful vibrant and bright Unicorn colors. 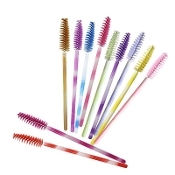 Mascara brushes is used for numerous things. Our dense bristols easily brushes through natural lashes to straighten any unruly lashes before application. A perfect gift to send home with your clients so they can manage their lashes between touch-ups.